Succulent Harvest Pumpkins for Fall | Faddegon's Nursery, Inc.
Sep 29, 2016 | Perennials, What's New? Our perennial and greenhouse experts, Sue and Aimee, have been putting their heads and talents together to create wonderful autumn decorations. 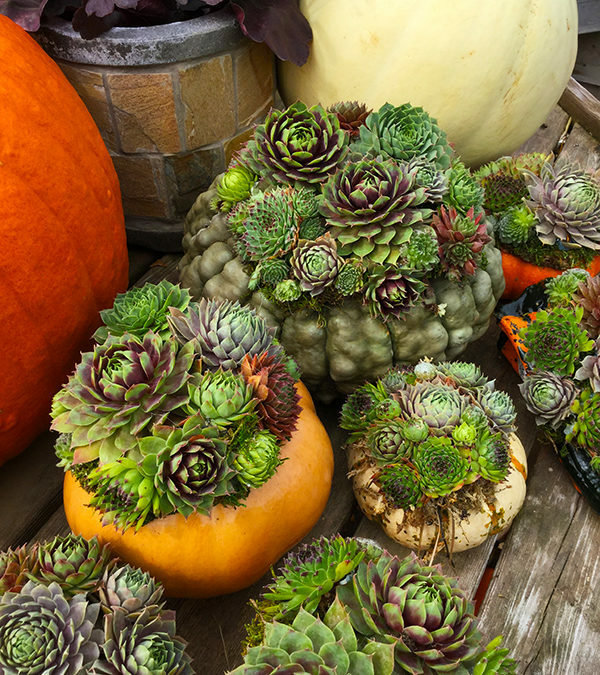 Along with their amazing fall plant baskets, they’ve added succulent harvest pumpkins to their repertoire! These “pumpkin gardens” have a dual purpose; first as a great autumn decoration and second as an easy way to add more succulents to your garden for next year. Yes, all of the succulents used are hardy, so when you are done with your arrangement, you can either plant them directly into your garden or into a container to keep indoors. It couldn’t be easier! Mist the succulents every other day. The succulents have rooting hormone on them and misting will help them grow into the moss. If kept as an outdoor decoration, misting is all you will need to do. If kept as an indoor decoration bear in mind the pumpkin or gourd will deteriorate at a quicker pace in a warm room. A bright but cool spot is best if you have one. If you don’t you may want to move your pumpkin indoors part-time, such as when entertaining. Planting is easy since your succulents now come with their own compost (the pumpkin!). When the pumpkin begins to rot, it’s time to plant! If planting outdoors, just plop the whole pumpkin garden into the ground with the succulents at ground level. If you are going to plant into a container, cut the top of the pumpkin off and set on potting soil.